I was asked the following question last week, and although I had the question slated for an “Ask Denise”, I felt the answer warranted an entire Zebra Report as this is something that seems to come up time and time again for my clients. You have people in your pipeline but for some reason they have indicated they are not ready until spring. I would actually like to offer some suggestions on your second point first because it is a challenge that I have heard from several agents lately. Many agents make the mistake of taking clients at their word and in the long run this can cost time and money. How many times have you taken out a buyer who wants “x” (for example, a four bedroom new house in the middle of town) and instead winds up buying “y” (a five bedroom fixer-upper ten miles outside of town)? Often, more time asking in-depth questions up front can mean the difference between a happy buyer one week later or twelve weeks later (after you have shown them dozens and dozens of houses). As agents, we need to do a better job of asking more in-depth questions to the second group as there may be objections that come up that may provide you with an opportunity to overcome their objection. Perhaps you can use market data and research to actually help the client speed up their process – possibly saving you both time and money. 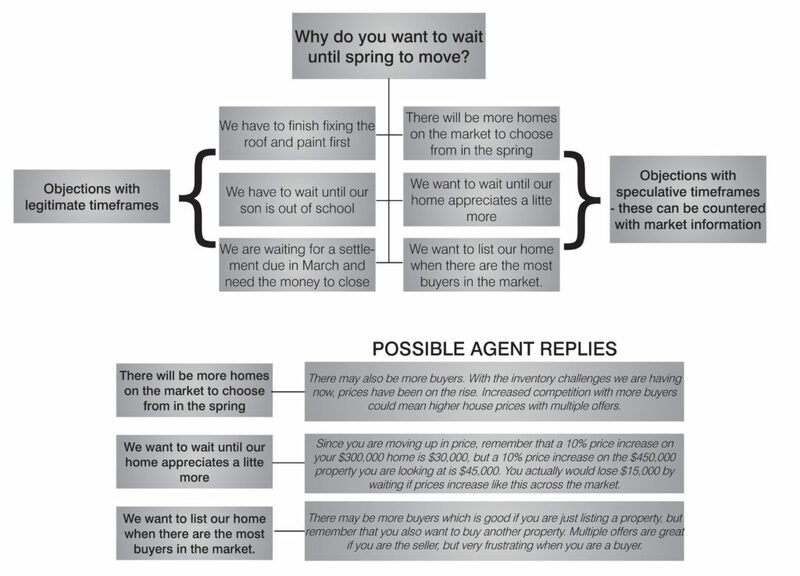 Take a look at the flowchart below and assume a potential client has indicated they want to wait until spring to move forward. By asking the question, “why?” we can see which timelines are dictated by need and which ones are market-driven assumptions. Now, really look at every person in your Potential Income Tracker (the way I suggest you manage your pipeline) and think about why they may not be ready until spring. Do you definitely know they aren’t going to be ready until spring due to an actual need or due to a market assumption? Do they need to do repairs or do they not want to look for another home until the weather warms up? If it is the latter, spend some time in front of your computer looking at the latest trends in your MLS. 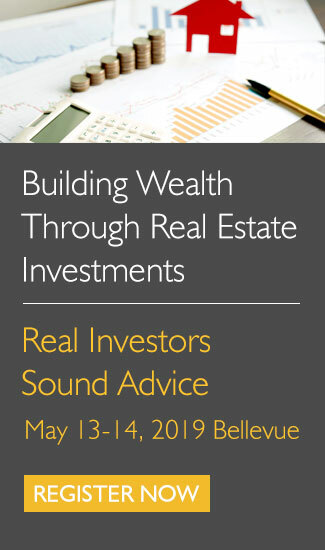 If your market is showing an inventory shortage with prices on the rise, then this is something you need to show them. If you can show them that their desire to wait until the weather warms up could actually be costing them money they will most certainly be more motivated to weather the cold and get out there and look. Potential buyers also need to see product. They need to see homes and it is your job to get the product in front of them. 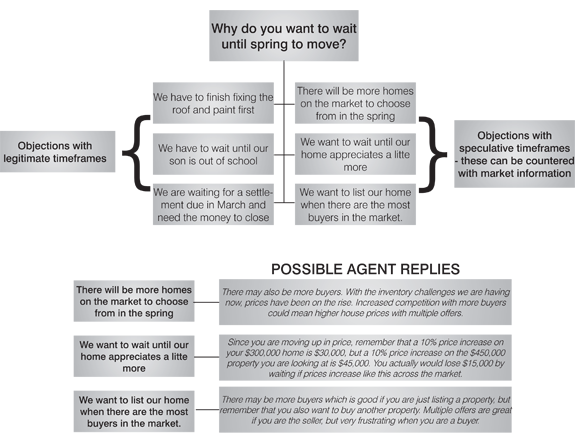 Also if a buyer is considering buying then they will always be interested in what the market is doing. Doing your research and sending these buyers stats and facts about new listings, pendings and sold properties is essential. Whenever anyone is in your buyer or seller pipeline, you have to treat them as though they will be buying or selling within the next month. That does not mean that you should call and hound them as this will only push them further away from wanting to work with you, but you do need to keep them up to date with research, stats, facts and properties to either view or compare to. In summary, don’t just assume a timeline is set in stone with the clients in your Potential Income Tracker, unless they are based on a concrete need. Make sure it fits your personality – if you love meeting people live, then perhaps open houses, networking groups or teaching real estate buyer and seller classes would suit you best. And if love using your computer and prefer to generate leads online or you love writing then perhaps blogging is better suited to you. Make sure it is consistent – the one thing all successful lead generation systems have in common is that they have the element of consistency. Whether that is a long term plan or a short term “burst” plan, these plans are consistent. There is a consistent delivery of information that is designed to attract potential clients to want to work with you. Make sure it makes sense in your market – lead generation needs to work in your market. You could be the most talented agent out there, but if you are trying to go after million dollar homes in an area that doesn’t have an ample supply, then that is simply not a match for your market. Be smart about the type of lead generation you choose, make sure there is enough opportunity in your market for this type of lead generation. Don’t get discouraged if buyers or sellers you are working with aren’t all jumping off the fence at once. In order to keep these buyers excited about the process you may need to entice them down off that fence with a little help from you. That help needs to come in the form of good relevant real estate related information that pertains specifically to buyers or sellers. to share has dramatically impacted my business in a very positive way. Here’s to a to a fun and successful 2013!